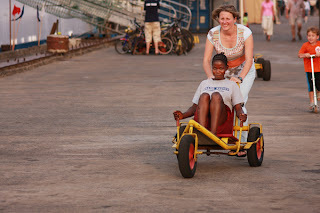 Mercy Ship Adventures: And God saw that it was good. I'm trying to mentally prepare myself for tomorrow. The person writing this post is not going to exist tomorrow. The people I meet and film are going to change me forever. Tomorrow is a day I have been waiting for for eight years. That is how long I have wanted to serve with Mercy Ships. I woke up this morning, late I might add, and as I tried to mentally prepare myself for tomorrow the book of Genesis came to my mind. In the first chapter one phrase is repeated, "And God saw that it was good". The word "saw" is repeated seven times. Tomorrow I want to remember this when I am looking at people who are outcasts of their society. God sees them! He saw them when he knit them together in there mother's womb. He sees their struggles and calls them to Himself. I want to see them the way He does. In his after photo, there is now hope, life and joy in his eyes. Malik saw that he mattered to people he had never met before. 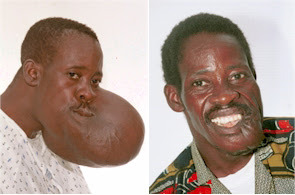 Malik had that tumor growing on his jaw for forty years. I can't erase what these people have gone through, but I am part of the team who can help to give him a new future. There are a lot of emotions and thoughts wrestling in my mind right now about tomorrow. Will I have to excuse myself from the line or the assessment stations to go into the back room to have a quick cry before going back out there? I can almost guarantee that will happen. How will this change me? I have no idea, but I hope I will have more compassion for people and realize how truly blessed I am. 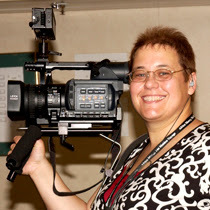 I'm going to change the direction of this blog now. Let's talk about ship life, shall we? Community!! That's what it's all about. I live in a cabin with two other ladies. We have one bunk that is not occupied at this time, which is nice. The cabin is about 150 sq. feet. 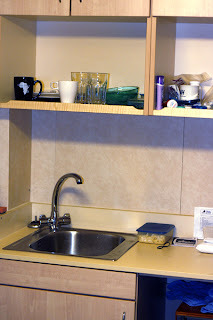 We have a couch, private bathroom and even a "kitchen" sink. 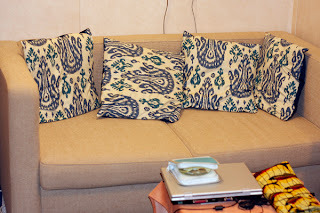 Luxury!! Now, I'm sure some of you, okay, MOST of you are shaking your head saying, "How do they do it?" Especially since all of you know I am not the neatest person around. It's a little hard to be 'really' messy when you don't have much to be messy with. But regarding the size of the cabin, we aren't in there very much. 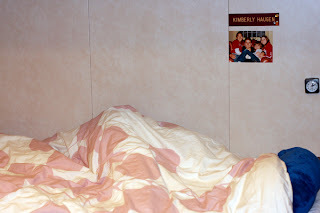 My bed with the photo of me with my nieces and nephew. So, we live in cramped quarters, all the crew eat their meals together, we have community meetings (with AWESOME worship) and we PAY to serve. What a life!!! The ship is our home, work place and recreational place. It's nice to get out and enjoy fresh, very HUMID air and be relational with each other. 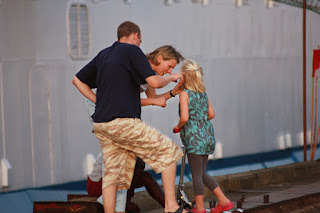 The kids on the ship have their bikes and when they are not trying to get their toys back from the adults who are playing with them, they ride up and down the dock. It is quite a joy to be part of. I took these photos the other evening. I must have been outside for about 3 hours just enjoying people's company and getting to know folks. People don't live most of their lives behind closed doors in their cabins. They live it in community with the rest of the crew. I like it! I was hoping to capture her first tooth coming out, but it remained stubborn and didn't pop out. 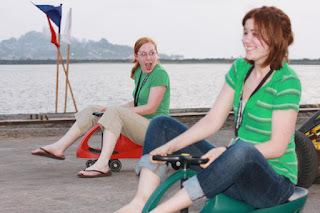 Lindsey and Alison, two nurses, racing on kiddie toys. 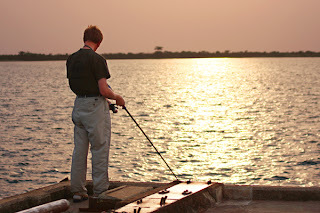 I don't know if he ever caught anything. Please keep all of us in your prayers on Monday. By the time most of you read this, we will be half-way through our day. 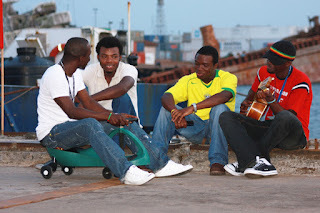 I would enjoy finding out what you would like to hear from Monrovia, Liberia. 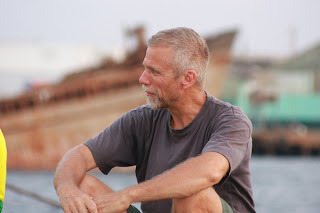 I would love to help you understand more of what the mission of Mercy Ships is. I still have a little over two weeks left. Can you believe the time is going by so quickly? You are part of my team and want you to feel as though you are here as well. Write me, let me know. "Keep your hands and feet inside the car"